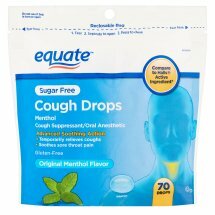 Active Ingredient (In Each Drop): Menthol 5.8 Mg, Purposes Cough Suppressant/Oral Anesthetic. Inactive Ingredients: Acesulfame Potassium, Eucalyptus Oil, Flavoring, Hydrogenated Starch, Hydrolysate, Isomalt, Sucralose And Water. Soybean Oil Used As Processing Aid.